Turn your iPad or Android Tablet into a teleprompter made specifically to fit ENG Cameras. You can easily load scripts, adjust speed, character size and colors. Simple software and remote (remote not included) allow users to produce professional results at low cost. 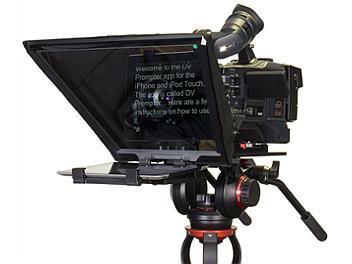 The prompter frame is designed to allow stand alone, in front of camera lens prompting. Expandable mounting bracket system allows simple but secure installation of tablet.